A pair of police officer brothers claim to have spotted 'UFOs' hovering in the sky on their way to work. 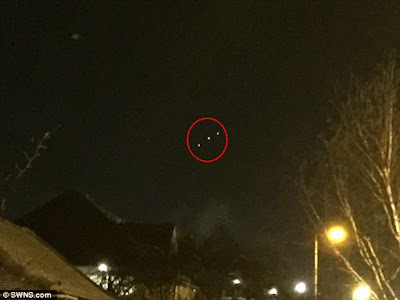 PCSO Simon Ives, 42, said he was walking to a bus stop, in Collier Row, Essex, when he saw an alien spaceship. Even more miraculously, minutes after Simon had finished rubbing his eyes in disbelief, his brother then got in touch to say he had spotted another UFO while driving down the M11. 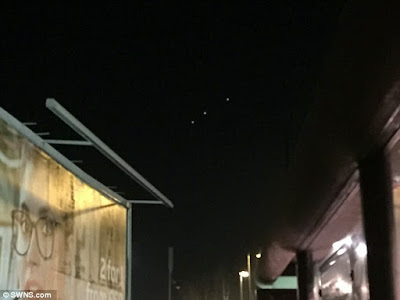 Simon said: 'I was on my way to work when I saw an object about the size of a football field with three bright orange lights hanging in the sky. 'It waited in a stationary position for about six to eight minutes before moving west over my head. 'It was absolutely incredible and I cannot explain what it was. 'I can safely say it wasn't a plane because from tip to tail it was far too big. 'I know it wasn't a commercial object. 'It could have been a dark, military project or possibly something from outside this world. Simon, who has served in the Met for 15 years, said: 'This isn't the first time I've seen a UFO. In 2011 in Leytonstone I saw something similar that I can't explain. 'I also set up a paranormal group a few years ago to investigate ghost sightings in haunted houses.